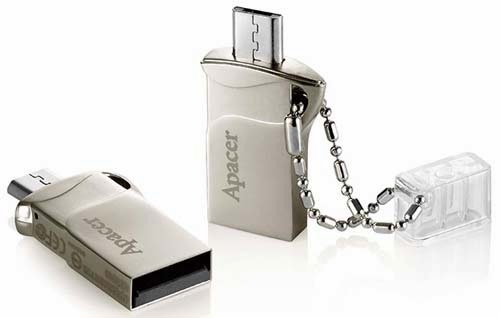 Apacer company release its AH173 Dual Interfaces Mobile Flash Drive that will surely impress by business professionals because of its convenience and portability thru mobile devices (such as smartphones and tablets). The AH173 OTG (On-The-Go) mobile flash drive, featuring dual interfaces, ultra-large capacity, ultra-svelte thinness, and metallic chic. 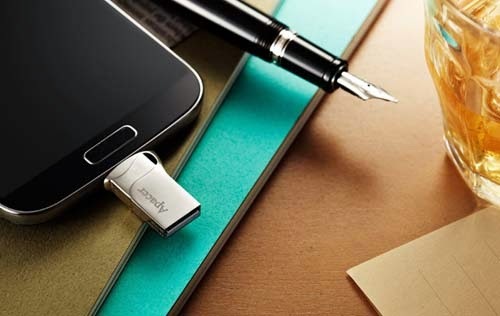 Once connected to a OTG-supported device, AH173 mobile flash drive doubles your Android smartphone and tablet capacity with maximum 32GB. It allows you to carry video, audio and large presentation files more easily. The ultra-thin zinc alloy body of the AH173 mobile flash drive exudes the sharp professional image of business people. 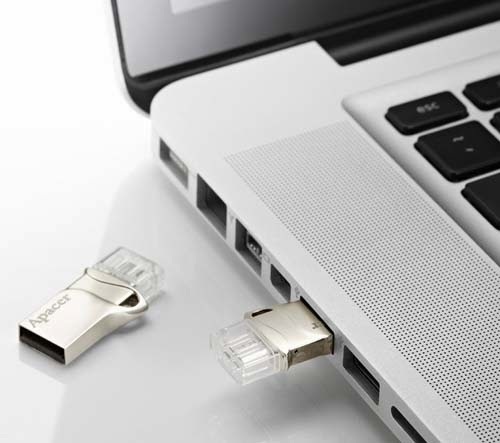 With built-in USB/MicroUSB interfaces, files can be transferred between mobile devices and PCs at exceedingly high speeds. The AH173 mobile flash drive implements innovative built-in MicroUSB and USB dual-interfaces. The front-end MicroUSB allows the connection with smartphones and tablets with OTG functionality to expand storage space. To connect with various PC devices, the flash drive also has the standard USB plug on the back. Dual interfaces in unison fully meet business mobile storage demands. Compared to Wi-Fi, 3G, Bluetooth, or other wireless file transfer modes, Apacer AH173 OTG mobile flash drive with the Micro USB plug delivers a faster and more stable transmission with no limitation on device specifications and no adverse effect on signal quality, so as to greatly save time while showing off an impression of professional efficiency! The AH173 is cast with high-quality zinc alloy, presenting a sleek and delicate streamlined style. These features not only match the refined taste of business people but also enhance the deft touch. The AH173 OTG mobile flash drive can act as a hanging ring, and its Pen Cap Design takes the use of a metallic ball chain, smartly connecting the cap with the body. Therefore, your smart lifestyle is fully enhanced by the portable design which cannot only be attached to cell phones and key chains, but can also be stored in your wallet and card case since it is only 0.6cm thick! As 16GB remains the standard storage capacity for most smartphones and tablets, users can only install APPs and shoot videos and photos due to such a limited storage space. Storing a large number of working files in mobile devices not only takes up storage space but also inhibits sharing and exchange. The AH173 OTG mobile flash drive comes in three capacities (8GB, 16GB, and 32GB), featuring doubled storage and brand new dual interfaces. Business professionals who use mobile devices in presentations or conferences can achieve ultimate work efficiency with the easy file transmission between mobile devices and PCs, thus substantially showcasing their professionalism with no additional effort! nice design i love it. flashy and techie and very fashionable good design. very portable and usable in everyday media needs. not yet release in ph market? can be used on all android devices? it depends if the android device supports OTG.